[W]hen you meditate deeply on compassion, a realization dawns in you that the only way for you to be of complete help to other beings is for you to gain enlightenment. From that a strong sense of determination and universal responsibility is born, and the compassionate wish arises in you at that moment to attain enlightenment for the benefit of all others. This compassionate wish is called Bodhichitta in Sanskrit; bodhi means our enlightened essence, and chitta means heart. So we could translate it as “the heart of our enlightened mind.” To awaken and develop the heart of the enlightened mind is to ripen steadily the seed of our buddha nature, that seed that in the end, when our practice of compassion has become perfect and all-embracing, will flower majestically into buddhahood. Bodhichitta, then, is the spring and source and root of the entire spiritual path. 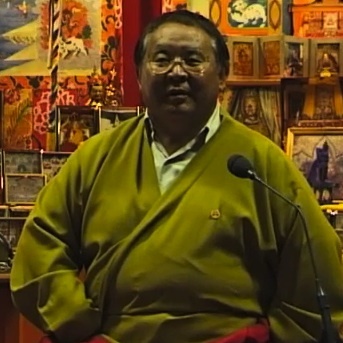 In this beautiful short teaching on compassion and bodhichitta, Sogyal Rinpoche explains how arousing in our minds this altruistic attitude towards others’ happiness and well-being brings us great benefit, freeing us of negative emotions and engendering in us ‘an enlightened courage’, the ability to remain in a positive and happy state of mind and deal with whatever problems we may face. For more teachings on compassion and bodhichitta, please visit our Videos page and the Teachings page of SogyalRinpoche.org.